We get so much from our pets; entertainment, companionship and unconditional love. But did you know that people can be accidentally infected with parasites we normally associate with cats and dogs, including roundworms, hookworms and tapeworms? These parasites can cause problems that range from intestinal upset to blindness or severe illness. Transmission of these parasites usually results from environmental exposure; however, careful prevention measures and hygiene can help prevent transmission from occurring. Zoonosis is the transmission of disease from animals to humans. Humans can be accidentally infected with ascarids (large roundworms), hookworms, and tapeworms, which are common parasites of dogs and cats. The problems caused by these infections can range from intestinal upset to death. It is estimated that 10,000 children in the United States are infected annually with roundworms and that approximately 750 will suffer permanent visual impairment or even blindness. How does a person become infected with animal parasites? People, especially children, can be exposed to animal parasites when they work or play in contaminated soil, such as in a sandbox or the garden, and accidentally put dirty hands in their mouth. Parasite eggs cannot be seen by the naked eye but are present anywhere stool from an infected animal is found. Sometimes fruits and vegetables growing close to the ground, such as strawberries and carrots, are contaminated. If not carefully washed, they can also be a source of human infection. How will I know if my pet has parasites? You may not recognize any illness until it is too late. Almost all puppies and kittens are born with ascarids and hookworms or acquire them shortly after birth from nursing. In newborn animals, the damage can be severe. Parasite eggs may be shed by animals that do not appear to be sick or run-down. So what should I do if I can't tell my new pet has parasites? Let us know as soon as you adopt the pet. The doctor can recommend an appropriate deworming program, which should begin as early as two weeks of age. 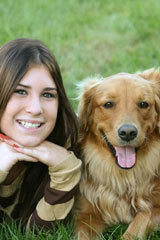 Deworm your dog on a regular schedule recommended by your veterinarian. This removes internal parasites and prevents further contamination of the environment. Practice good hygiene. Wash hands regularly, especially after handling pets or cleaning up pet waste. Remove pet waste from your yard at least 2-3 times a week. Daily is best. Wash all fruits and vegetables thoroughly before eating. Keep pets flea-free. Ingestion of fleas can transmit tapeworms to animals and people. Do not allow children to go barefoot, sit or lie on playgrounds or in parks where they are exposed to animal stools. Hookworm larvae can penetrate the skin. 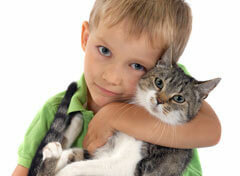 Clean cat litter boxes often, daily is best, and wash hands afterward. Do not drink water from streams or other sources that may be contaminated with animal feces. Keep pets clean; bathe pet after deworming.